Our full-stack ad technology platform has become the first ad server certified by Nielsen Digital Ad Ratings in France and Europe. 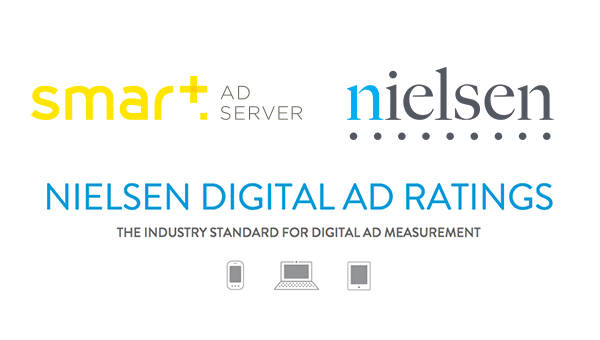 Publishers that distribute campaigns on mobile applications using Smart AdServer’s SDK can now, with the help of Nielsen distributor Mediametrie / NetRatings, offer advertisers the means to measure audience campaign data. Nielsen Digital Ad Ratings measures reach and frequency per campaign target. The measurements first combine anonymous and aggregated demographic data supplied by Nielsen data partners. The data is then adjusted using information gathered from Mediametrie/ NetRatings audience panels. What can be measured now? Of France’s top 50 editors, 70% use Smart AdServer’s full stack, a combination of its ad server and its integrated SSP, Smart RTB+. The incorporation of the Nielsen measurement is quite a breakthrough; for the first time, campaigns distributed on mobile apps can be measured using indicators such as reach, frequency and GRP (Gross Rating Points). These KPIs, similar to those Nielsen uses to measure television campaigns, will allow advertisers to make relevant measurements and evaluations.